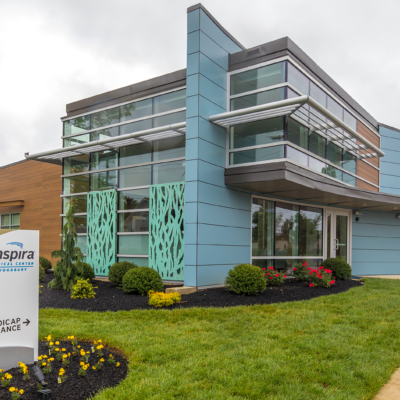 Inspira Oncology Center – Woodbury, NJ | Sustainable Modular Management Inc. 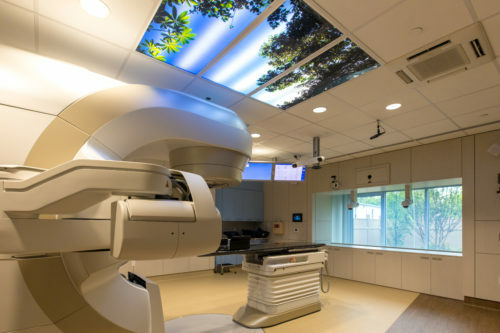 The Inspira Medical Center was in need of a new oncology center in Woodbury, New Jersey to serve as a comfortable environment for patients receiving radiation treatment. The medical group wanted a high-quality building with pleasing aesthetics to enhance the patient experience as well as house state-of-the-art medical equipment. SMM built a Radiation Therapy facility utilizing modular block construction to house the advanced radiation treatment equipment. The remainder of the facility was a custom-designed modular building delivered to the site and assembled for permanent use. 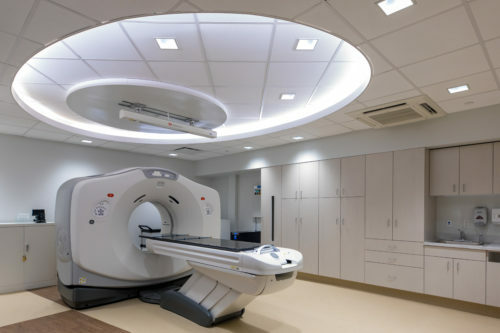 The result was a complete treatment facility with a modern design, high-quality fixtures, lighting and sound systems throughout that provides radiation therapy for patients. SMM worked with Inspira to design and build the 6500 sq. ft center that consists of eight 12’ x 40’ modular buildings all constructed to meet relevant codes and to withstand inclement weather. 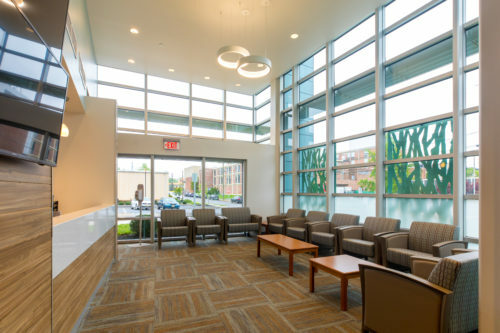 What makes this freestanding oncology center unique is its overall serene look and feel. 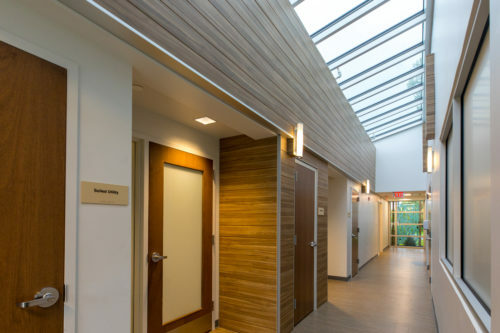 The building features a contemporary color palette, a healing garden, and plenty of natural light throughout provided by a clerestory skylight and curtain wall, which was of utmost importance to Inspira in creating a welcoming environment for patients. The center houses a Varian Linear Accelerator Therapy equipment, a new CT simulator, modern examination and treatment rooms, a conference space, staff lounge, offices and other patient areas. This free-standing facility is fully FGI compliant and meets all DOH Mandates. 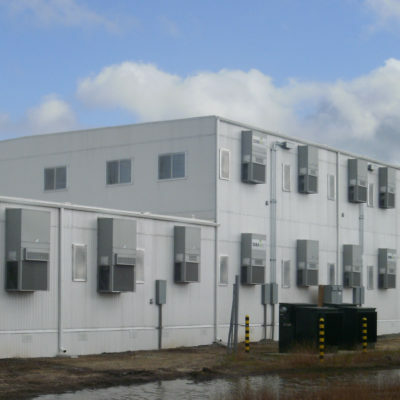 SMM offers discounted previously leased modular buildings for a quick and affordable solution. Sustainable Modular Management, Inc. (SMM) provides custom commercial modular construction and design. 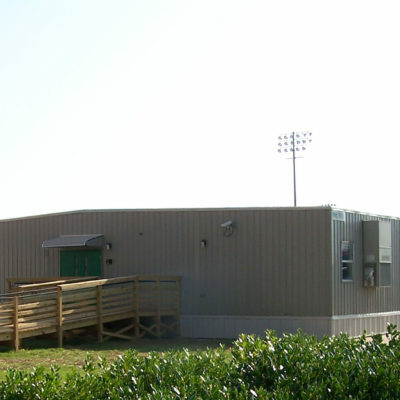 SMM, as a modular building supplier and general contractor, has delivered new and used modular buildings including portable classrooms, medical clinics, healthcare buildings, and modular offices throughout the United States and Canada. We provide project management, modular manufacturing, delivery, installation, site construction, building maintenance and facility management, as well as capital leasing for modular buildings in the government, healthcare, education, energy, and commercial industries. SMM is a Cambium United Company.